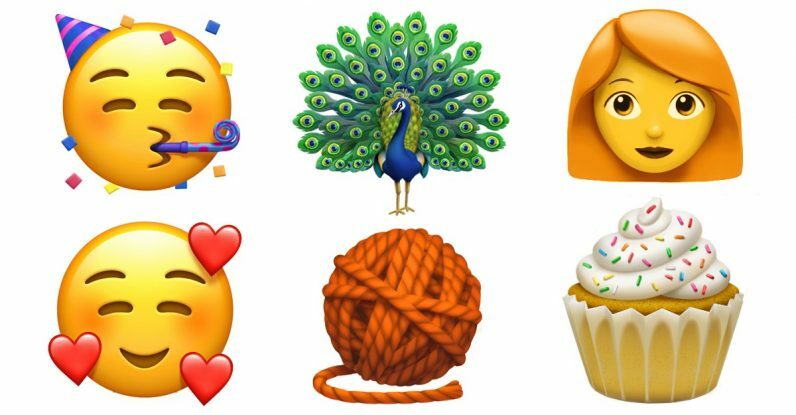 Poised to celebrate World Emoji Day on July 17, Apple has released previews of the next 70 emoji coming to iPhone, iPad, Macs, and Apple Watch with a free software update. These update include a number of human emoji, along with a handful of animal and food emoji. Among the new batch, Apple plans to finally, finally add redheads to the roster of human emoji, along with bald heads, grey hair and curly hair — so it’s quite an update for hair (or lack thereof). These hair updates come in the full range of skin tones as well. Emoji face updates include a freezing face, a pleading face, and a party hat with a noisemaker. There will also be a number of food emoji, including lettuce, cupcakes, mangos, and moon cakes. Animal emoji include lobsters, and a surprisingly detailed peacock. There are a handful of miscellaneous emoji in among the rest. For example, you’ll find a Nazar amulet, for warding off the evil eye. There’s also an infinity symbol, and a new male and female superhero. My favorite is the orange ball of yarn — I’m an avid knitter and that’s as close as I’ve gotten thus far to having an emoji which appropriately describes what I’m up to when I’m in “clicky-clicky needle” mode.